← Page 155/365 : Career On The Up? Page 156/365 : £50k Friday? Gotta be in it to win it! We’d attempted phoning up Monday and Tuesday to get on, to no avail. Monday’s player scored 5 and Tuesday’s player scored a good score of 7, so it would take some beating. Elle and I both attempted to get through, after I wasn’t even going to give it a go today in exchange for watching The Deadliest Catch on Sky+ that we recorded last night. Elle talked me out of putting that on in favour of the competition. Both our phones were just getting the engaged tone, but then all of a sudden, Elle’s made it through to a ringing tone. She chucked me the phone…and Real Radio picked up. I was placed on hold until after Jessie J’s “Price Tag”. Then Dixie & Gayle, the breakfast show presenters, came back to the phones and picked a line at random….and it was me! After the rules were read out so I understood (basically only “Fact” or “Fiction” was accepted and I could only answer after a question had been fully asked), we were ready to go. Fergie is a Member of the Black-eyed peas. …and another four I can’t quite remember. Anyway…I got 11 right out of the 14 I managed to answer and moved into the lead in the week’s competition. I got the Christmas Day one wrong, and the Facebook users is just over 1billion, and I had said fact…and the STUPID one I got wrong was the Last Of The Summer Wine one…I knew the answer…but I said Fact! ARGH! Idiot!!! But, I am in the lead…and if no-one manages to beat 11 tomorrow or Friday, I will win £500…and then if no-one actually manages to beat 11 before June 27th, I will move onto the £50k Friday final to be in with a chance of winning the big money. Now…I am a huge believer in Fate. But the best thing is…the prize money on that…..£50,000….so is it fate that just an hour later we got through to a competition to possibly win the exact same prize? Keep your fingers crossed people. 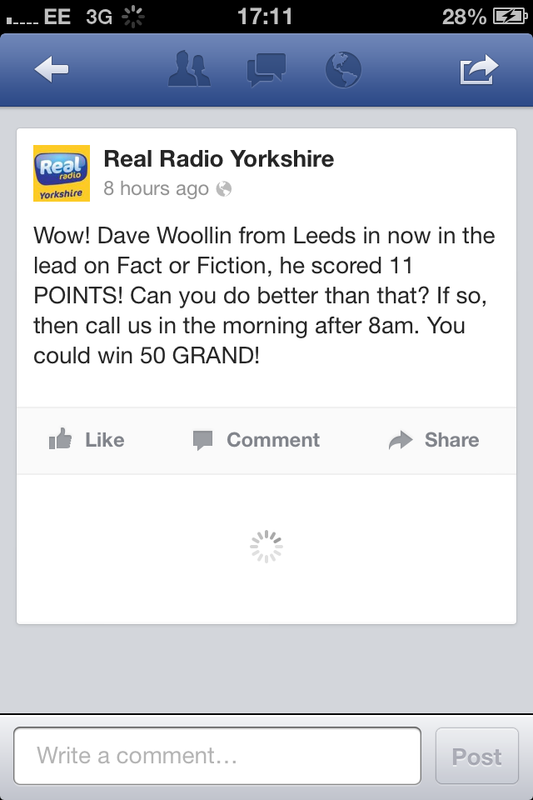 This entry was posted in 2013, 365, TV and tagged 50 Grand Friday, £50k, £50k Friday, Fifty Grand Friday, My Man Can, quiz., Real Radio, Real Radio Yorkshire. Bookmark the permalink.